Here at Tecton Trust we take the impact our projects have on the environment seriously, we recognise the need for social responsibility and are constantly working with our partners, clients, subcontractors and suppliers to find sustainable solutions for projects to better protect the world around us. The use of solar panel technologies are on the rise the world over and Tecton Trust has the experience and skilled engineers to keep up with the ever growing installation and maintenance requirements. We provide skilled Romanian renewable energy engineers to provide Romanian renewable energy facilities management services to every level of the marketplace. 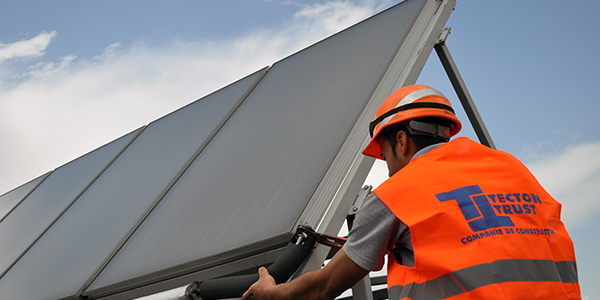 Whether you are in need of new solar panel installations, or require ongoing maintenance of your existing solar panel installations in Romania, Tecton Trust are a Romanian renewable energy company you can rely upon. With solar power heating becoming more popular and more efficient with the sophistication of these systems continuously evolving, maintaining these systems requires experienced engineers and specialists who have knowledge and experience, a skilled team to effectively and efficiently manage all your buildings heating & cooling maintenance. 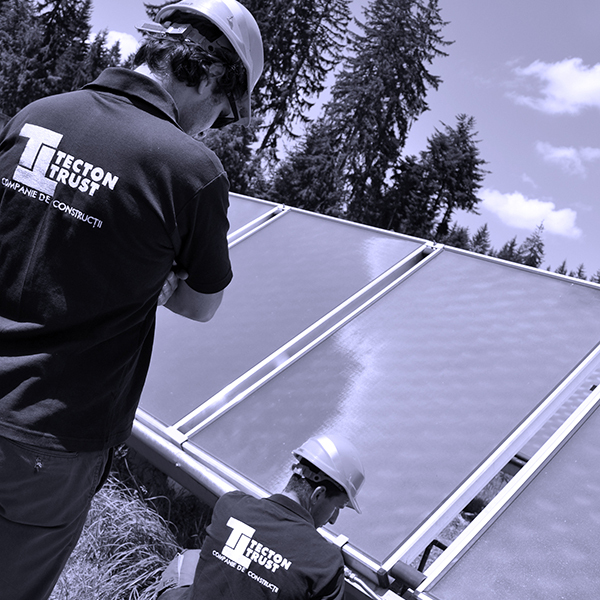 Tecton Trust keep up-to-date with the worlds ever changing heating & cooling systems and the latest Romania solar power heating systems to ensure your heating and cooling facility management is always kept cost effective and your assets are energy efficient with the environment. Tecton Trust Romanian Green Solutions Division is reliable and trustworthy with a highly skilled team of Romania solar panel installation engineers and Romania solar heating maintenance engineers and specialists on hand to effectively manage, install energy efficient improvements and materials, and implement PPM (Planned Preventive Maintenance) scheduled inspections and procedures to maintain and increase the energy efficiency of your heating systems and general Romania renewable energy maintenance to decrease your buildings long-term running costs. Tecton Trust strive to use materials that have no environmental impact, are safe in their intended use, efficient in their consumption of energy and natural resources, can be recycled, reused or disposed of safely. During the early planning and design stage of your project we can offer a multitude eco friendly building materials. We endeavour to continuously research new energy saving products and materials to ensure our clients the latest eco friendly Romanian renewable energy solutions and will individually tailor the provision of planned and reactive maintenance services to suit the needs of each customer to achieve the highest level of operational consistency, ultimately putting in place a cost effective FM package that will improve the efficiency of your building operations. We will meet with you to discuss every detail, implementing property strategy, new renewable energy technologies when necessary and ongoing building maintenance, including administration and contract management. 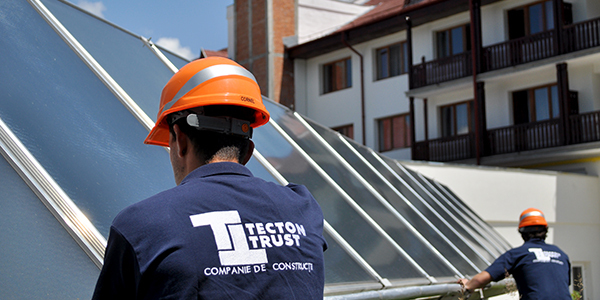 Tecton Trust Romanian Construction Company builds for a future to better preserve the environment. Recognizing the need for social responsibility, we are constantly working with our partners, clients, subcontractors and suppliers to find sustainable Romanian renewable energy solutions for projects to better protect the world around us. Our primary environmental goal is the prevention of pollution. We strive to use energy efficient materials that have no environmental impact, are safe in their intended use, efficient in their consumption of energy and natural resources, can be recycled, reused or disposed of safely. Our code of discipline requires that all employees conduct their duties and responsibilities in compliance with all applicable laws and current industry standards when it comes to pollution prevention. We also train our employees in the areas of environmental awareness and relevant environmental issues. Listening to you, to realise your vision and begin with detailed planning to provide a cost effective and efficient timeframe, to never compromise your project, this is our first priority. We then devote all our resources and start building for you with passion, always committed to excellence, working to the highest moral and legal standards, making Tecton Trust a risk free Romanian construction company solution. Our mission is to constantly set the benchmark in construction of high quality buildings and protect the clients’ interests through qualified, multi-disciplinary expertise, modern technology, energy efficient materials, a variety of customized services and the latest in renewable energy solutions. With Tecton Trust there’s no compromise, we guarantee satisfaction with our dedicated team of top professionals. We pride ourselves in delivering the most perfectly comfortable yet energy efficient homes, productive office spaces and bespoke hotel environments, along with strength and efficient practicality in our industrial builds, all built with passion and delivered on time and on budget, with the paramount goal to exceed our client’s expectations. Here at Tecton Trust we always undertake full responsibility of all aspects of every project. We absorb the vision of a project until it runs in our very fibre. We are not careless executants; we are dedicated builders with passion… a deep passion to responsibly build your vision. Tecton Trust builds for a future to better preserve the environment. Recognizing the need for social responsibility, we are constantly working with our partners, clients, subcontractors and suppliers to find sustainable solutions for projects to better protect the world around us. Whenever possible, we strive to use energy efficient materials and Romanian renewable energy solutions for heating and power with our projects, keeping the environment in mind from the planning stage and into the future with our Romanian building maintenance and facilities management services.